Bellot Strait, THE NORTHWEST PASSAGE – Too often, we tend to talk about the fabled Northwest Passage as if it's a single route through the Canadian Arctic. It's actually at least seven main routes through a complex array of islands, peninsulas and straits. There are more commonly used routes and less commonly used routes. Different routes were discovered by different explorers. Still, even as passage is made easier by receding sea ice and improved tools, technology and knowledge, some of the routes stand out. 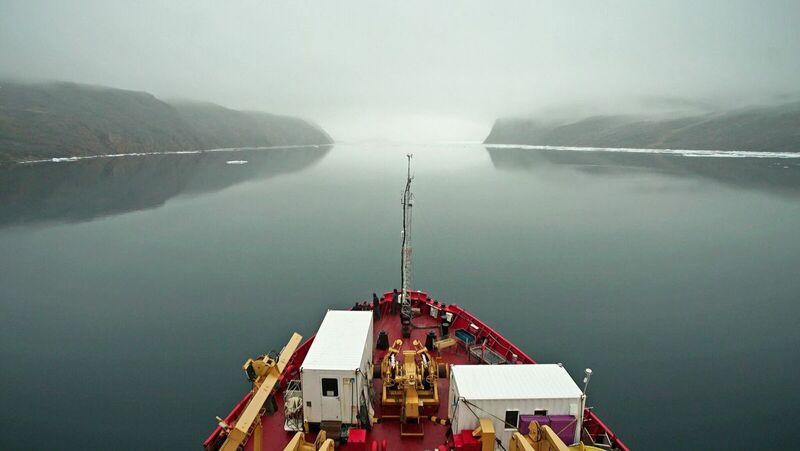 That's certainly true of the Bellot Strait, one of the passage's narrowest and notorious, for being a difficult trip. "Has complex currents," one Northwest Passage authority warns. That turns out to be an understatement, as two journalists from The Washington Post recently found out when they – with a full complement of scientists from the ArcticNet consortium at Université Laval in Quebec City – passed through the strait last week aboard a Canadian coast guard icebreaker, the CCGS Amundsen. The navigator Henry Larsen, who made the second and third full Northwest Passage transits in the 1940s, made the first successful west-to-east completion Northwest Passage, using a route that included the Bellot Strait. He described it in vivid terms. "This strait is only half a mile wide and there is a terrific current," Larsen wrote, as quoted in the chronicle "Arctic Labyrinth: The Quest for the Northwest Passage," by Glyn Williams. "As the ice came pouring in behind us, there was nothing else to do but crash into it and attempt to drift through. This we did; the strong current causing large whirlpools in which large cakes of ice spun and gyrated. Many times we thought the ship would crack like a nut under the pressure." Larsen made it through the strait aboard the 104 foot vessel the St. Roch. The CCGS Amundsen is 300 feet long, weighs 6,000 tons and splits ice with a sharp hull. And today, it is safe for a ship like the CCGS Amundsen to travel through – thanks to a modern understanding of the complex tides that wash through the narrow waterway. Bellot Strait occupies a key strategic location – it separates the Boothia Peninsula, which thrusts northward out of the North American continent, from Somerset Island. If we hadn't opted to take it, we would have to travel much farther north, around the entirety of Somerset Island, before getting another chance to progress eastward and then south toward our ultimate destination. As we moved into the strait, the ice cleared and ocean soundings showed that the waters were extremely deep – several hundred meters. The canyon walls showed vertical striations of rock layers, even as small waterfalls poured down from above. The great depth suggests a glacial history, according to Mark Furze, a geologist with MacEwan University who was along for the trip. Probably, during a succession of ice age advances and retreats, glaciers helped to scour out the bottom of the strait. The Amundsen stopped in the middle of the strait for around two hours, a window that allowed the scientists on board to conduct oceanographic research and to survey the nearby landscape by helicopter. Meanwhile, along the sides of the strait, floes of ice were moving by rather quickly. Later, after we'd passed through safely, Claude Lafrance, the ship's commanding officer, took some time to explain how the strait worked with the help of a navigational chart. In the process, he lent credence to some of the observations made by Larsen more than 70 years ago, while also explaining how modern knowledge has made navigating it safe with a proper tidal understanding. The essence is that depending on when you are in Bellot Strait, the waters can be flowing either westward or eastward at and around high or low tide, respectively. So timing your crossing makes a great deal of difference. The danger is that if you're coming from the west (as we were) with the current to your back, you can be moving too fast, and have difficulty steering your vessel as you approach rocks at the end of the strait. "We always want to go through where it's more difficult, with the current against you, because it's a lot easier to control the movement of your ship," Lafrance said. Therefore, the two-hour wait was quite intentional: The CCGS Amundsen stayed put until the tide began to shift and the waters to flow back westward, in effect neutralizing the current. Then the ship steamed out easily. "We just passed at the ideal time to go through," Lafrance said. But he acknowledged that without today's knowledge, navigating could have been more difficult and dangerous for Larsen or others. Lafrance also said he did see small whirlpools at the end of the strait. So when the time came for the CCGS Amundsen to leave the strait, the scientists withdrew their samples, the helicopter returned from surveying, and we were on our way. We passed, unremarked, Zenith Point, the most northern point of the Boothia Peninsula and also in continental North America, at slightly above 72 degrees North Latitude. From the ship, we watched as a polar bear scaled the steep walls on the Somerset Island side of the strait. There was little ice around, and we wondered how the bear would get back to sea. Perhaps it had chosen to spend the rest of summer there until the ice returned. Soon we saw, against a distant hillside on Boothia Peninsula, a herd of muskox, huge thick-furred animals that are common in the Canadian archipelago. As the clouds parted and the sky cleared, the ship called out a whale sighting off the starboard side as the strait widened, and we moved out of it and into the little charted Gulf of Boothia. Meanwhile, from space, the WorldView-1 satellite, owned by DigitalGlobe, homed in on the CCGS Amundsen and captured its exit from above as it emerged from the clouds. The early explorers struggled with Bellot Strait – modern navigation, though, has conquered it. We understand the tides and currents, can even monitor our progress from space. But these modern abilities only serve to deepen the sense of awe with which one must think about those who came before – who took it all on anyway, with only a shred of our knowledge, and many times the risk.